Why dont 343 get someone on the pro team to showcase the game? They have Ghost, Neighbour, derksky etc on their team but they get a thumbless guy to show off the game? Logic. It is like that on almost every game they show on E3. It is to show the game off to the audience. It would be hard to follow if MLG Doritos Champ xxDeRsKyxXsniPex was speedrunning through the level. Does anyone else just not like the sound it makes when you get a kill? At least they removed the hitmarker sound, but all these beeps and clicks from shield regen etc make the inside of my skull itch. I wish they would have just stuck with the traditional shield regen sound. Also, is the iconic Halo voice guy going to be in arena gamemodes? The woman in Warzone isn't terrible, but I would miss the iconic "gained the lead" "lost the lead" scripts in his voice. Also, there's no voice for multi-kills in Warzone. Would there just be too much going on for that? There seems to be a little popping sound whenever you get a headshot. Looks like a DMR without the marksman scope. If that's really a thing it would make sense as a spawning weapon in order to limit the ease of use at range without otherwise gimping the weapon. Could be possible they haven't implemented it yet, voice acting is usually the last stuff to be done. Looks like the statue for the Limited Collectors Edition will be Blue Team & Fireteam Osiris. Xbox.com says this: "The Master Chief and Spartan Locke appear as a team – but there’s another story… the statue splits and they separate, ready to face-off. Which scene tells the true story?" I'm a little late with posting about Warzone but it looks like a crap version of Invasion from Reach, which is a shame because that was one of my favorite playlists. It was only one of my favourites however when you basically played Invasion Spire or Invasion Boneyard every single game, I thought Invasion Slayer was bad and all the forge maps added were bad. Anyway back to the point; they said the map/s are four times the size of any other Halo maps, this is absurd. Highlands? (i think) from Reach was WAY too big for 8v8, some of the H4 maps too. So that four times bigger to increasing the team size by 50% is going to be horrible imo, unless they condense where we fight (similar to Invasion from Reach). I'll try keep an open mind but it just looks like a SUPER casual playlist with all the flying stuff/fighting elites etc and picking loadouts. forge maps added were bad. LMFAO, they actually added forge maps to it? maps lagged in 4v4, I don't even want to think about the lag in invasion size maps. Yes, and they appear over Spire and Boneyard 90% of the time, so you usually don't even get an option to vote for them. They were TERRIBLE maps, completely ruined that playlist. I remember this flat, two-base invasion forge map that just made me want to smash my console it was so bad, and it was all anyone would vote for. Again, this briefing was probably meant to sell consoles and games to new players. The chaos is appealing to casuals. Its not like all of our favorite playlists wont be featured in the game upon release. Each new title has brought us new pros. I wouldnt worry about a thing. Am I right in thinking you can spawn in the bases you capture? This was such a great example of "if it isn't broke, don't fix it". They possibly thought the playlist needed more variety, wrong. I played it for Invasion (not Invasion slayer) on Spire and Boneyard over and over again. Oh I have no doubt it's appealing for casuals, that's why I wasn't originally going to post my opinion because I sound like an elites competitive player. But as I've been posting I do enjoy stuff in Halo that isn't MLG, Invasion was a good example of this because Warzone is just Invasion on steroids haha. Yeah that's not too bad then, not to keep going back to it but just like it was in Invasion. - I'm going to assume that WarZone is unranked and will use the SR progression system? Warzone is unranked (no CSR), but uses MMR behind the scenes. Stay tuned for GamesCom in six weeks. Medals in Arena and Warzone are different? Arena and Warzone share most of the medals. However, while Arena's medals are less in quantity and more "skill" focused (I.e. no "Kill" medal), Warzone has a huge amount of medals. Confirmed. In Warzone we use medal feed to highlight mode-appropriate events to help reinforce in-session progression and scoring. Jeff Steitier remains the announcer for Arena. Jennifer Hayle plays the Warzone commander. Separate voices for each experience. I believe cards unlock what items you can buy, and energy lets you buy the items. Then your cards get consumed after the item is bought. Correct for power weapons, vehicles, etc as they are single use. Loadout weapons are persistent. Once unlocked, they remain available (but only once you've leveled up your REQ level sufficiently in each match). Yes. This is one of the advantages of capping and holding bases. You can spawn forward in the map and pressure the opposing team. Also in the case of the garage you can bring out vehicles from the center of the map, which is HUGE. The demo we are showing at E3 has accelerated earn rate for energy to allow people to bring out more powerful items earlier and more often. That's because we expect most players to get a single shot at playing the mode, and we have compressed the timeframe of the mode to allow more players to experience it on the floor. So be warned that it's a little crazier looking than normal play. In Saucey's video you can see x3, x1, etc under the items in his requisition menu, and he said he was given cards. So I believe cards unlock what items you can buy, and energy lets you buy the items. Then your cards get consumed after the item is bought. god....damn it. Either the card system gives random combination of guns with different attributes, or that's just simply an oversight like how in halo 4 it was the reach dmr as the pick up indicator. so how does this card system work, how is it balanced, what kind of things are given in cards? Like I saw things like common cards and rare cards(been hanging around bungies work place I see), so does that change the stats of weapons and vehicles that can be earned? I know you must be exited to talk about warzone but could you give an update on whether or not two player online Split-Screen is still making it into the game or not? @@Sal1ent thanks for all that clarification! A few questions regarding the Req packs. Can we expect Req Pack Micro Transactions? (I actually don't think this a bad thing since you still have to earn them in game, it would just be for filling your inventory) I ask just because of the recent reveal of Premium Req packs. The Power Weapons appear to have different rarities? Are there going to be numerous variations to each weapon, or maybe just a Legendary version of each one? The Loadout system for Warzone IS staying, correct? Frankie might have misspoke when he said it would have equal starts (maybe he just meant the beginning of the game). How many Warzone maps can we expect? Does each map have a different weapon and vehicle sandbox or is everything available across all maps? Are there multiple game modes for Warzone or just the one? Excellent as always Josh. One last thing, is Joseph voicing the Grunts in H5G? Halo 5: Guardians Limited Collectors Edition will release prior to October 27th, 2015. 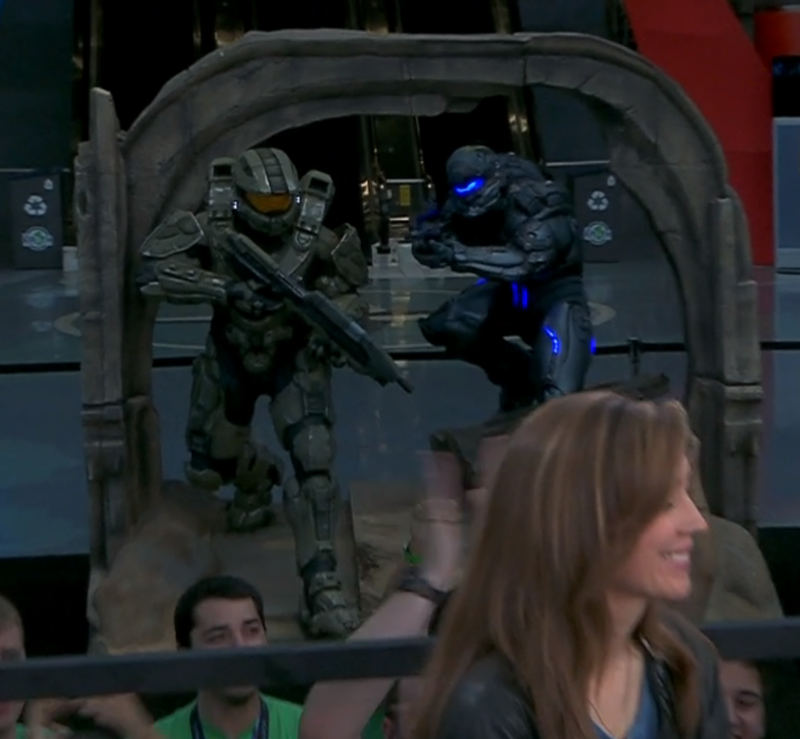 That's a life-size version of the statue coming with the LCE of Halo 5. Lots of people find unstructured chaos fun. If you go into there with a full team wanting to dominate, against another team wanting to dominate, that unstructured chaos will turn competitive extremely fast. You'll see chaotic firefights between teams but the team with the better strategy will win. However, I am worried about these cards. The more I hear about them the more I like them. How many maps at launch for Warzone?